Now here's a beer after my own heart: a Texas-brewed, pug-themed Schwarzbier. Let me explain. Another group of Texan brewers over in Shiner brewed up one a Schwarzbier I credit with my awakening to better beer, Shiner 97. Also, my house is currently infested with three pugs (along with an English bulldog). I'm in love with the concept, but what about the beer itself? As I mentioned above, this dog is a Schwarzbier, which is a essentially a darker and drier version of Munich Dunkel— a beer whose (dark) bark is bigger than it's (light) bite. Ugly Pug is hopped with Perle hops, while the backbone is built from 2 Row, Munich, Chocolate, and Carafa Special II malt varieties. Okay, my pugs are gathered around anxiously awaiting my verdict, so let's get to it. Appearance: Deep brown, nearly black at times, with dull ruby highlights. On top, a decent off-white head that leaves little lacing. Aroma: Earthy roasted malt with hints of coffee and chocolate. A little thin. Taste: Much the same. The flavor profile is earthy, smokey, nutty, and mildly bitter malt accompanied by coffee and chocolate notes. Nothing much in the way of hops. While complex, it's still somewhat thin most of the time. The aftertaste is relatively intense and tastes of roasted grains. Mouthfeel: Too light for my preferences. The carbonation is pretty sharp, but not too biting. Drinkability: With a light body, somewhat thin (yet tasty) flavor, and low alcohol content, this goes back quickly. 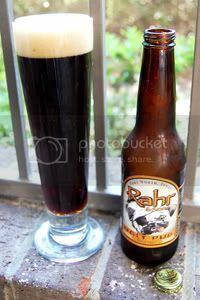 Verdict: A nice enough beer, but not my favorite Texan Black Lager (that award goes to Shiner 97). Everything here is tasty enough, but there's just not enough of it if you catch my drift. If this was just a little more intense and full, it could be a winner. I've never had a "Texas black lager" but the concept sounds cool. I want to track one down now.